It's almost like a badge of honour: fresh-faced tech businesses are falling over themselves to secure .io domains, and acquire a part of the startup identity. However, the decision to ditch their .com isn't without consequences. By opting into the .io craze, startups are causing themselves a whole ton of stress further down the line. Today, I'm looking at 3 reasons a .io domain will damage your tech startup. Why Are .IO Domains So Popular? A great name needs to be short, simple, memorable and unique. Buy the .com from the owner. Keep your name and choose a different Top-Level Domain (TLD). The shorter and more memorable your name, the more expensive the .com will be; prices can range from the hundreds of dollars into the tens of thousands. If we assume that a fledgling startup can find a better use for $10,000 than buying a URL, option #1 isn't usually viable. Though growing in popularity, .io domains are nowhere near the market satuaration of .com's. There's a solid chance your name will be available and, with most .io domains costing little more than $100, affordable. For a ton of people, the startup scene is a counter-culture movement, created in opposition to faceless businesses and corporate bureaucracy. Ditching the big buck world of .com domains and opting for a unique identifier is appealing to a ton of founders. With I/O being shorthand for Input/Output, what better than a domain that speaks the same language as developers? Rub.io is a shortened URL for Marco Rubio's 2016 Presidential Campaign. Postach.io is an Evernote-to-blog app. Card.io is the home of PayPal's card scanning technology. Hilarious! And that's reason enough to ditch the .com, right? Right? Most tech startups buy .io domains because they can't afford the .com; they don't have the scale or resources to purchase it. But what about other startups that manage to secure their .com? How do they compare to your business? It doesn't matter whether they've acquired their .com because of better resources, choosing a less sought-after name, or sheer luck: they'll look bigger and more successful than you. Even if you can't afford your .com from Day One, you need to have a plan in place to acquire it as soon as viable. If it looks like an impossible feat, you need a new name. Another criteria from the SMART startup naming checklist? 'Timeless'. .io domains are growing in popularity, but how will we view them five or ten years from now? A few years ago, startups were ditching vowels from their name like there was no tomorrow. Now, Flickr and Tumblr exist as testament to a trend that seems thoroughly outdated. More recently, the massive popularity of .co TLDs has taken a sharp downturn, thanks in large part to the improved functionality of predictive search. Why? Search engines are starting to send precious traffic away from .co addresses, and towards their .com counterparts. .io domains have a real appeal to the tech-orientated; particularly the developers and founders that work in startups. And that's exactly why you shouldn't choose them. It doesn't matter if your name or web address appeals to you. It needs to appeal to your target audience. If your SaaS solution is designed with developers and SaaS founders in mind, (ignoring the previous two problems) .io domains may foster a sense of understanding and empathy. But what if you're trying to appeal to marketers? Sales people? HR teams, or accountants? To them, a .io domain means nothing; even worse, it's unfamiliar and confusing. 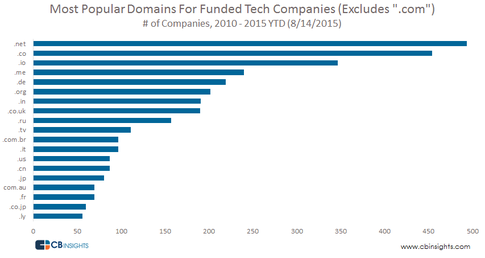 "100% of the top 20 YC [Y Combinator] companies by valuation have the .com of their name. 94% of the top 50 do."